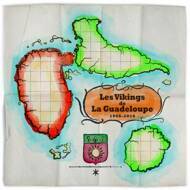 Best of Les Vikings De La Guadeloupe! The return of the most important French Antillean band of the 60’s and the 70’s. They bring a unique mix of Biguine, funk, Latin, Compas and early Zouk.